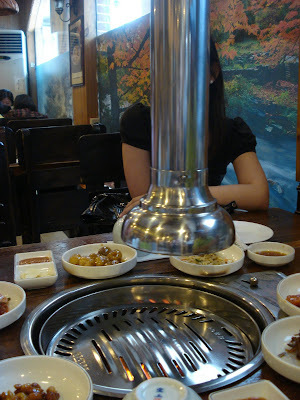 Back when I was still a kid, my parents would bring me to this classy Korean restaurant called Arirang. It's a three-story fully carpeted restaurant where we would order plates of Korean bbq meat to grill and later on dip this in their delicious sesame soy sauce before enjoying it together with a spoonful of fragrant sticky rice. As kids, we were pretty blessed as we would frequent this restaurant almost every week. 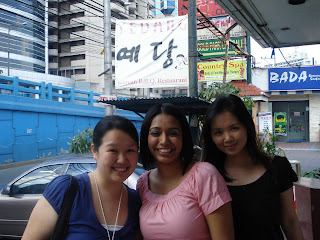 It was definitely sad news when Arirang closed down and later on, bid adieu to the Philippines. Since then, we would try various Korean restaurant in the metro but nothing still came close to our memorable dining experience at Arirang. Then, my dear college friend Sandy came to visit after leaving the Philippines for the US 7 years ago. Of course, her visit was a momentous one as I've been waiting to see her again and to catch up on each other's lives. I sent her a message asking if she has any preferred cuisine or is currently craving for something. Her answer was short and simple: "I would like to try a really good Korean restaurant if possible." Without wasting any time, I did my research, thanks to Didi who highly recommended this restaurant to me, I made plans to have lunch at Ye Dang Restaurant along Meralco Avenue in Ortigas. Entering Ye Dang instantly reminded me of a cozy looking Korean home where it's made of mostly wood and there's actually an elevated area with a low table for customers who would like to have that complete Korean dining feel. We just took a regular table by the window with a griller installed at the center. Sandy told me to take care of ordering our meal and so while Paul was busy entertaining my dear friend, I was completely immersed in the menu while choosing the best dishes for our lunch. 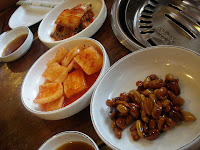 Simply because I wanted to make this meal truly memorable for my friend, I tried my very best to order just the yummiest Korean dishes that I know of. Of course, this was with the help of our very friendly server too! One thing I love about dining at a Korean restaurant is when we get to enjoy 8 different types of appetizers consisting of kimchi, sweet baby potatoes, beansprouts, fried dilis, sweet peanuts and a lot more! Everything looked so colorful and was so inviting that we all happily dig in trying each saucer after saucer. Our first dish was the dak-Kui / grilled chicken (Php. 250). After our server put in some hot coals inside our griller, she laid down strips of chicken and quickly turned it every so often. She also gave us a plate of lettuce and mint leaves together with a siding of bbq sauce and garlic to wrap the meat in. Of course, my favorite sesame soy sauce was also present as I enjoyed dipping every single meat into my sauce before adding it into my leaf and spreading a thin layer of bbq sauce and a piece of garlic before enjoying. Shortly after, our second dish came. 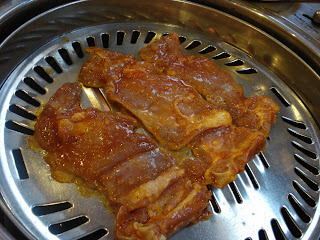 The Taegi Kalbi / Grilled Pork Spare Ribs (Php. 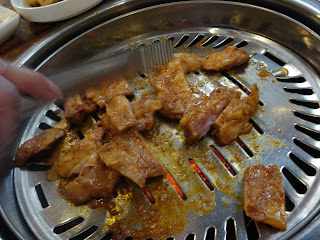 250) was really delicious! Imagine enjoying bite size pieces of ribs the Korean way. 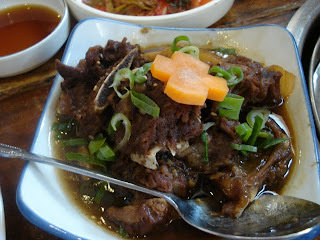 Of course, I just had to add in my favorite Korean beef stew otherwise known was Kalbichim (Php. 300). While the serving was pretty small, we all enjoyed the tender cuts of beef mixed with the aromatic onion leeks which pairs very well with our Dolsot Bibimbap / Vegetable hash rice in hot stone bowl (Php. 250). Lastly, I got an order of Pajon / Seafood with Green Onion Pancake (Php. 300) just in case my friends had too much meat already. This was a light addition to our hearty lunch to which I can see Sandy was truly enjoying. Over lunch, we chatted and updated each other on the happenings in our lives. I'm glad that I was finally able to introduce Paul to my dear friend and she happily listened as we updated her on our current Big Day preparations. It's sad that we only have three hours worth to bond but as we parted ways, I was so happy that Sandy had a lovely time and I have Ye Dang to thank for. 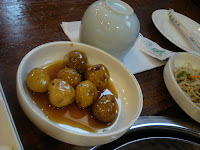 Ye Dang is located at 88 Meralco Avenue (near Metrowalk), Ortigas Center, Pasig City. Call them at 636-1461.
first time i went here, i instantly liked their food! esp. the beef/chicken with lettuce wrap, mmm...and during our visit, they seem to have gotten the approval of lots of Koreans as well. Yes I love Ye Dang :) It was also suggested to me by a friend and I thank her for leading us to this fantastic food discovery.